Thanks for contacting me. If you contacted me about sharing your personal story, please click the link below to book in a time to speak. This will just be an initial chat so I can explain a little more about the project and answer any questions that you may have. I am really looking forward to speaking to you! Click here to book a time to chat! Please tick ALL the times you can make and I will email you a confirmed time along with a link to Zoom. Zoom is a simple, easy to use video software similar to Skype. You can use it from any PC, MAC, tablet or smart phone. Simply click the link to launch the software! "A highly readable book that is packed with a tool box of easy-to-use techiques to help you to start to unstick your life and move forward. The bite-size chapters are written in a lovely warm, lighthearted and friendly style, making you feel that you're being supported every step of the way. You can choose the ideas which resonate with you the most, and mix and match to get your own personal life plan. I enjoyed the idea of the chimp sitting on my shoulder trying to sabotage my life and he's now had a gentle talking-to so he sits chattering away to himself in the corner rather than constantly blocking my way. Overall, this is a highly recommended read if you're not satisfied with your life and want a comprehensive guide full of simple concepts that you can apply to your everyday life to make positive changes. I greatly enjoyed not only reading this book but also using it to take action, albeit starting with those all-important small steps which can lead to significant long-term benefits." "Wow, what can I say what a great read. I didn't want to put it down. Inspirational lady for sure, couldn't believe what she's gone through and come back fighting & on top. Written with a totally honest, no nonsense approach,gritty funny and heartfelt. The Author didn't hold back on any of her life details? I felt a strong connection with her and wanted to know how she was doing. I look at my life now,and want to make some new positive changes." "At the start, Jo herself says you do not need to read both parts of the book if you don't want to as the first part is her personal story that brought her to where she is today, full of ups and downs and a great example of survival, and the second half provides invaluable tips and strategies on how to stay positive when the bottom falls out of your world. 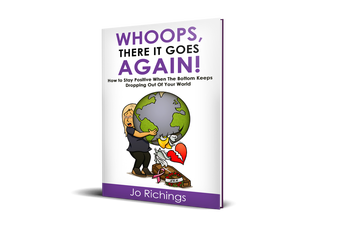 Well, I highly recommend reading the whole book to get an insight into how we can ultimately recover from most things life throws at us if we have the right tools, provided here by an expert life coach."